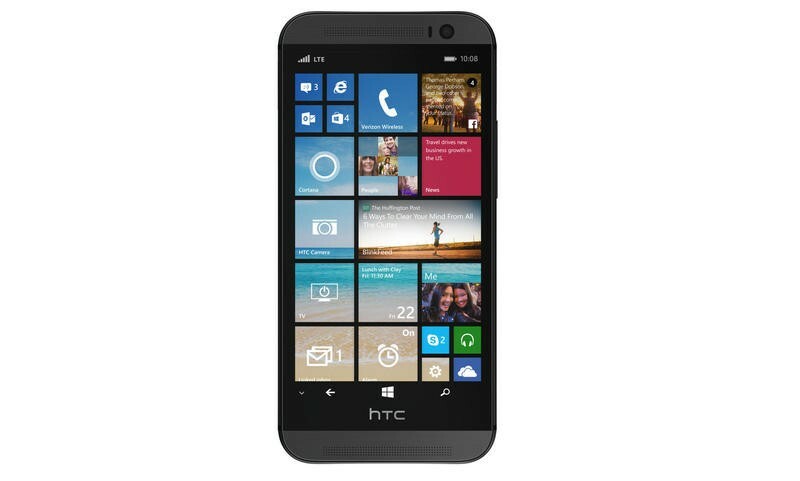 Several rumors have suggested that HTC is gearing up to launch a new Windows Phone device, perhaps dubbed the HTC One W8, in the near future. The device will reportedly carry over the same industrial design elements that were first introduced in the HTC One (M8), including a primarily aluminum unibody design, though it will run Windows Phone instead of Android. Now we’re getting our first look at it. PCMag has published a picture of the rumored phone, which is still live on Verizon’s site, providing our first glimpse at what may very well be the One W8 — though the URL still refers to it as the M8. If you look close you’ll see the live tile for “TV,” which doesn’t exist on any other Windows Phone devices. That seems to confirm that the phone will include an IR blaster. Unfortunately we can’t see the back of the device, however, so we don’t know if the Ultrapixel camera is in tow, too. Also of note: the front-facing BoomSound speakers are present, and it looks like the wide-angle front-facing camera is intact, too. HTC is holding a press event on August 19 in New York City, where we have a sneaking suspicion this may make its official debut. We’ll be reporting live, so be sure to check back then.